Instead of a Wrist to Forehead Sunday nor yet a Sunday Cinema, I will post about our up and coming Christmas decorations. 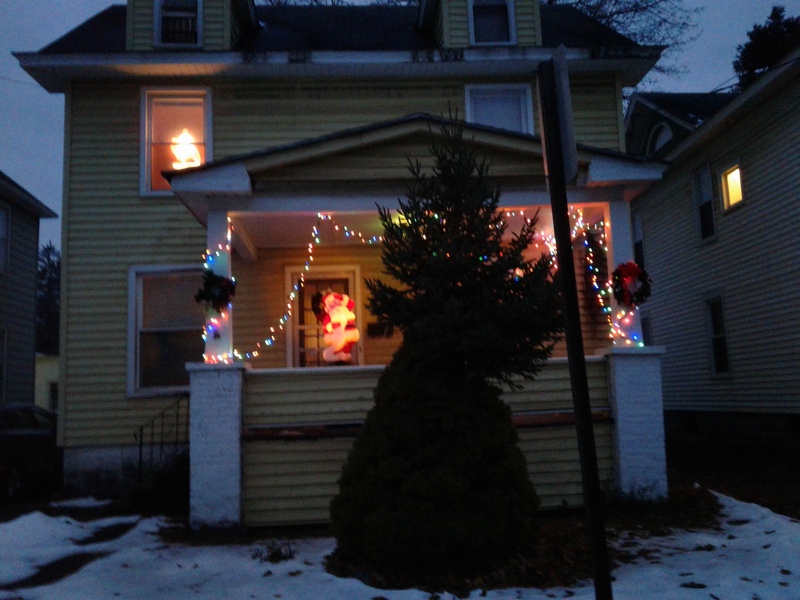 Today was a little warmer than the past two days, so we seized the opportunity to get some lights onto our front porch. The results fall short of other front lawn and porches, yet I feel they are worthy of some notice. Oh yeah, we put up a couple of wreaths, too. After impatiently waiting for the sun to go down (yes, much earlier this time of year, let us not begin that lament! ), I stood across the street in the road and got this picture. Actually, I walked into the middle of the road, but no cars were coming, so it was all right. He looks better in real life than in the picture. 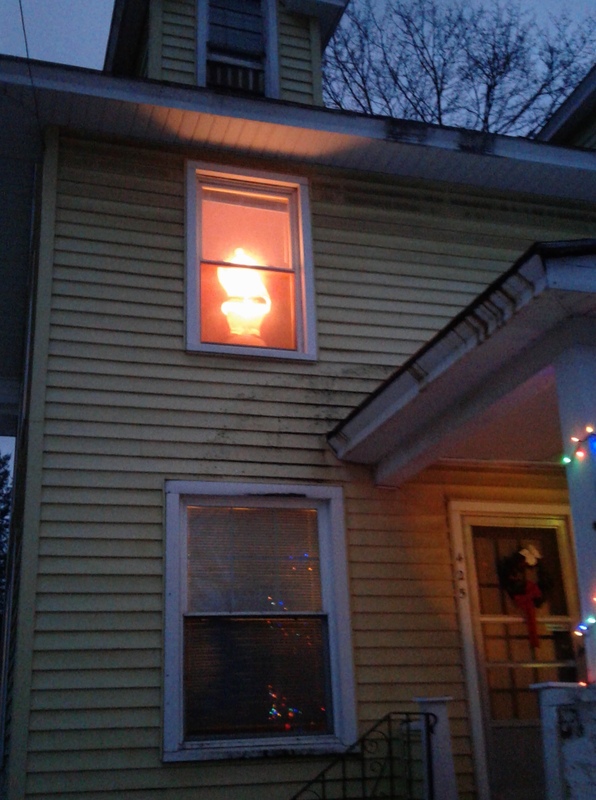 New this year, I put one of our Santas in an upstairs window. Full disclosure: I thought of this after I had carried said Santa from the attic to our second floor. I did not want to carry him down another flight. 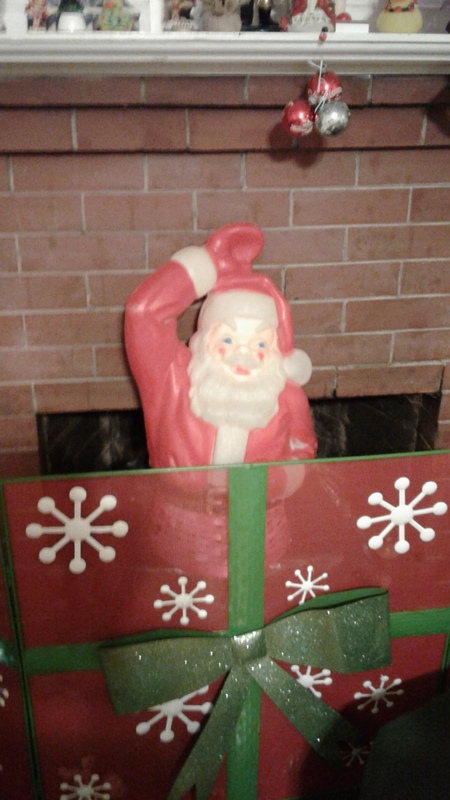 Our other Santa has been on the landing, three steps up from the ground floor, since last Christmas. 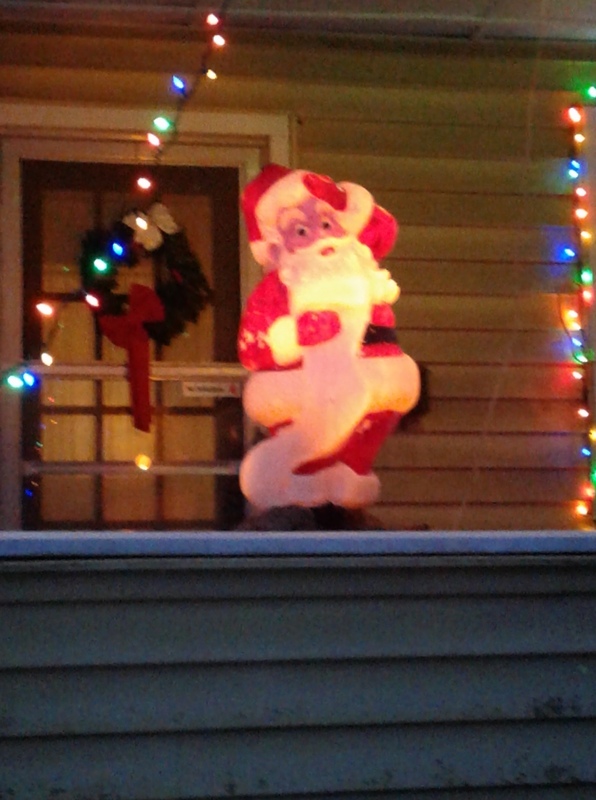 I think this Santa looks cool in the upstairs window, although he is a little washed out in the picture. These things happen when one is not a professional photographer, as obviously I am not. He’s older, he’s awesome, thanks Mom and Dad! 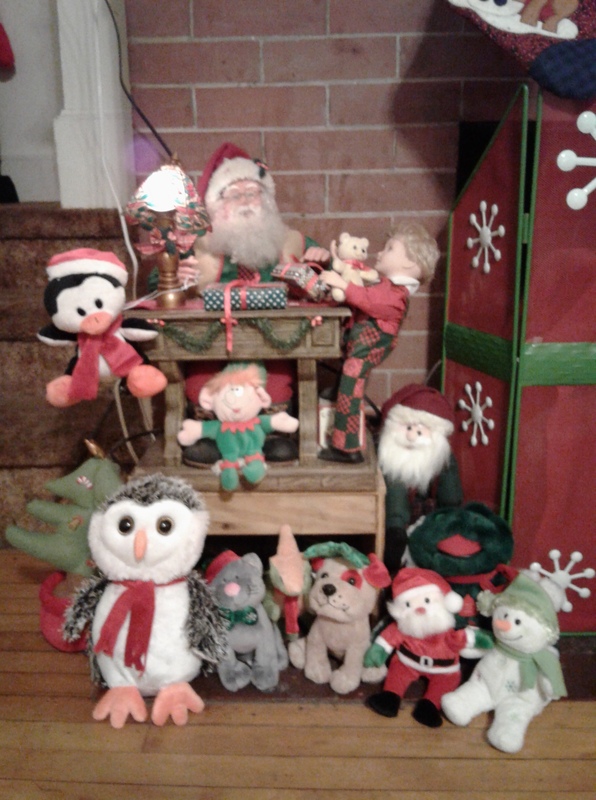 We put our older, better Santa on the porch. My Mom and Dad found him at a second hand shop when they were visiting my sister in Pennsylvania. I just love a vintage Santa Claus! It is difficult to get a good picture of our front porch with that large tree in front, but Steven will not hear of cutting it back. 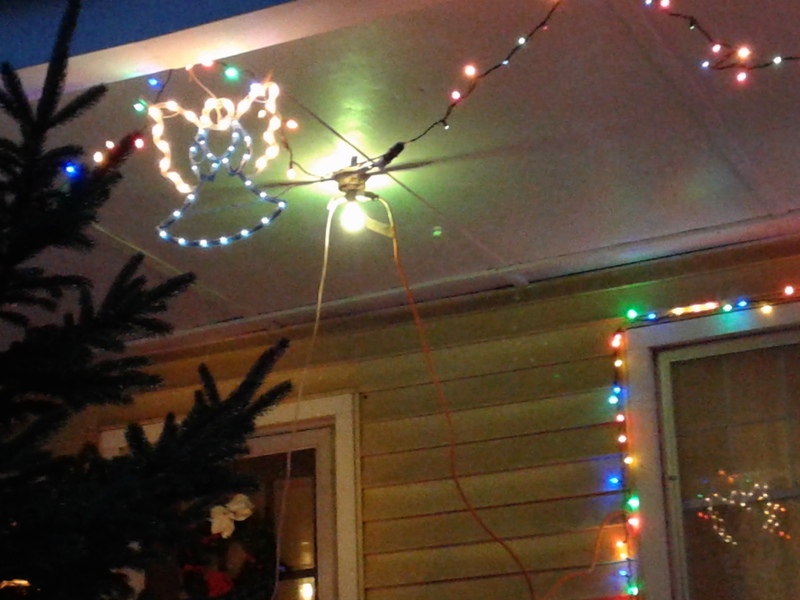 Nonetheless, I tried to get a picture of the angel that graces the middle of our lights. I hope she shows up enough for the pic. So here is my little bit of Christmas, for the end of Thanksgiving and my birthday weekend. Tomorrow I go back on overtime, so I hope I can still manage somewhat decent blog posts. Time will tell (Time is certainly a blabbermouth, although I have already done that joke). Happy Sunday, everybody! Posted in home, humor, personal and tagged blog post, blogging, Christmas decorations, Christmas lights, front porch, lights, Santa Claus, Sunday Cinema, Wrist To Forehead Sunday. Bookmark the permalink. That Squirrel Didn’t Bring Me a Present! So I have about twenty minutes before Steven gets home from work and thought I might be able to get my blog post done. He fooled me yesterday. I thought he worked till 5:30 but it was only till five. He’s sneaky that way, but I think I have the right time today. What I do not have is a blog post, but we’ll see what I can come up with. Earlier today, I was out on our deck, taking out the trash and recyclables, when I heard a hoarse chirpy kind of sound. This dumb squirrel was on our tree, eating a nut and, apparently, taking exception to my presence on my own deck. I told him what I thought, but he was not impressed. Like any self-respecting person of the 21st century would do, I went inside to get a device to take his picture. 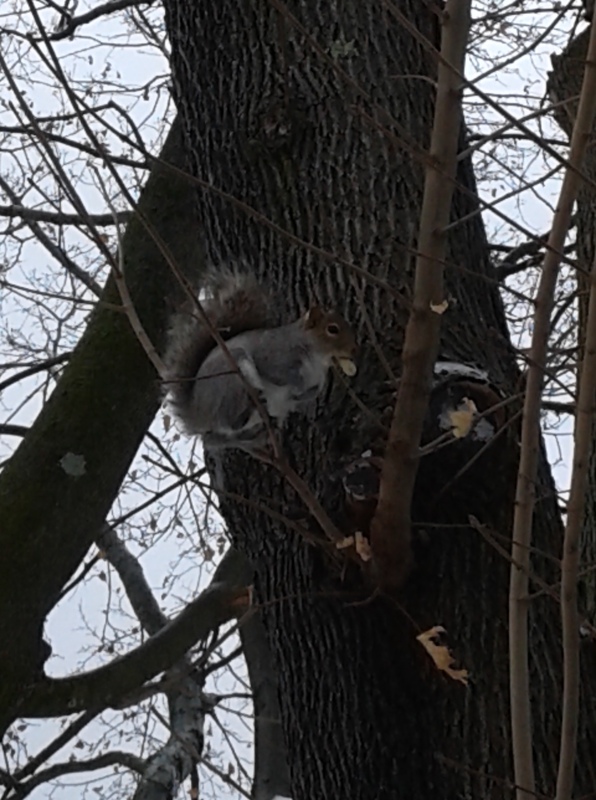 If I only had audio, you could hear how audacious this critter was. I’m afraid it is a little too dark, but my Tablet does not have a flash. At least, maybe it does but I don’t know how to turn it on. OK, I am not really a self-respecting person of the 21st century, but I would like to be someday. Anyways, I sat down to write a blog post with the words “But Here’s a Squirrel” in the title, then I thought I’d like to add a couple more pictures. So here is an update on a couple of our Christmas decorations. We’ve added presents. Steven surprised me with this tableau. But can we trust this motley crew not to open them? This scene is a little busier, and the presents are not wrapped as well. No matter. It is Christmas Eve. This is the day we realize we are not going to have the Norman Rockwell, Hallmark Card Christmas we envisioned back in November, and that is OK. Enjoy your Christmas if you celebrate it; if not, enjoy whatever you do. Peace. Posted in humor, personal and tagged blog post, Christmas, Christmas decorations, christmas eve, Christmas presents, squirrel. Bookmark the permalink. Wordless? Not So Much. Christmas Decorations? You Got It! I thought I would try one of them there Wordless Wednesdays. For one reason, Steven and I have to get our Christmas cards written tonight, so I can’t sit here with the computer on my lap pondering what to say. Of course, being me, it will not be entirely wordless. I enjoy words far too much for that. But I took a few pictures of our Christmas decorations I would like to share. My Mom and Dad gave me this fiber optic tree some years ago. It is our only tree these days, for reason I believe I explained in an earlier post (and if I didn’t, it’s not that interesting anyways). 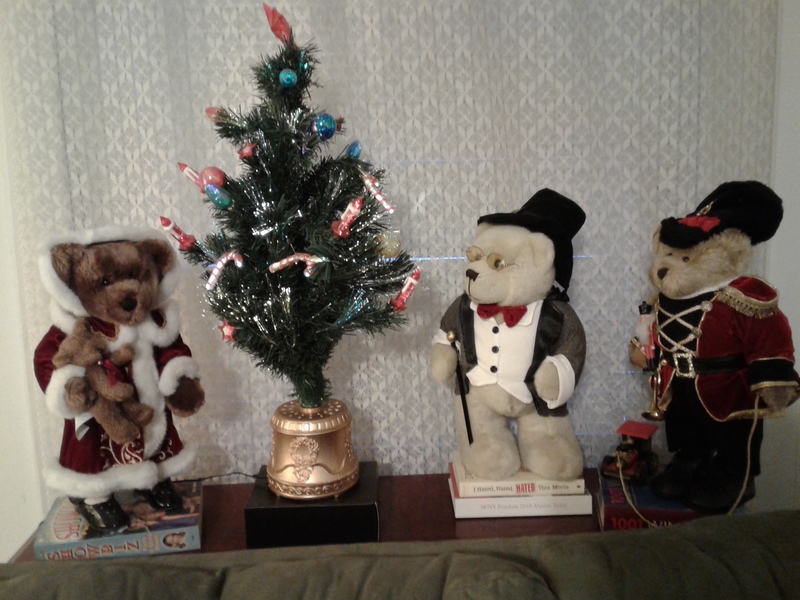 The cool bears we purchased at Michael’s in August, GA, when I was in the Army, an increasing number of years ago. Busy, cluttered, a little random… just like my life. I guess I got kind of a weird angle on this picture, and you can’t really see all our little things very well, but you can get an idea of the fun surrounding our CD player. 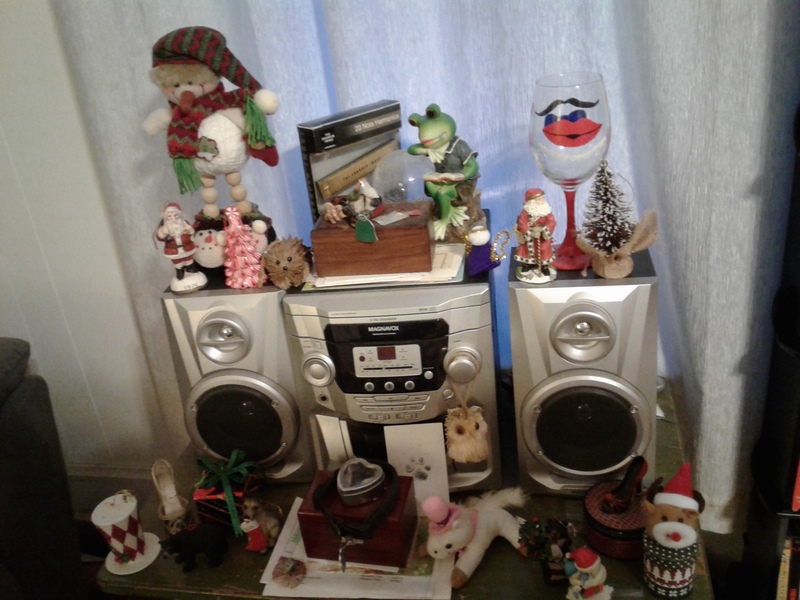 On this CD player, each year I attempt to listen to every one of our Christmas CDs, including as well as a wide variety of music, a couple of versions of A Christmas Carol. I usually miss a few. We have a large collection (who, us, go overboard? Say it ain’t so!). This is not all our DVDs and videos either. I randomly hung the Christmas trees up, and Steven added the stocking. 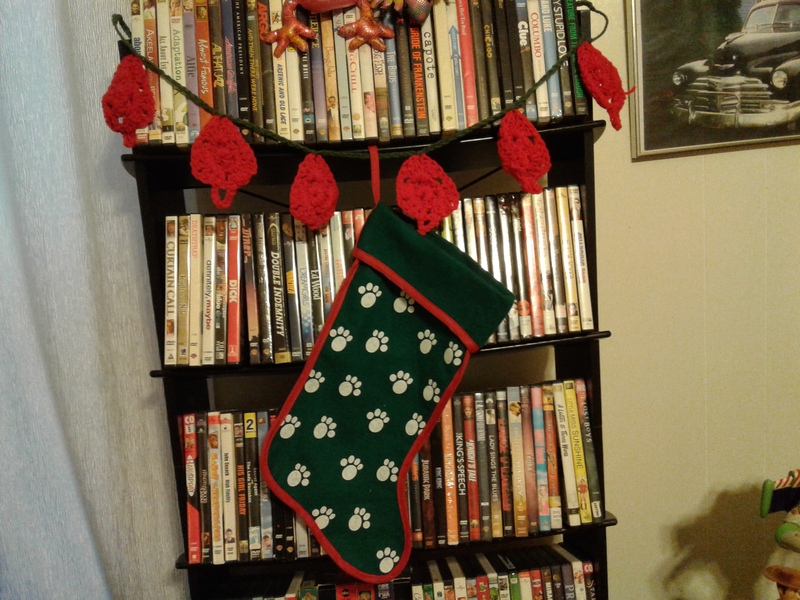 The stocking belonged first to Tabby, then to Spunky. If we ever get another dog, it will be his or hers. The Christmas trees are an invention of mine, a kind of a granny triangle (regular readers may recall that the only thing I know how to crochet is a granny square). I’ve been making them for years, sometimes as individual ornaments, sometimes as garlands like this one. Well will you look at that? I am over 300 words. Wordless Wednesday indeed! I can’t do anything right! 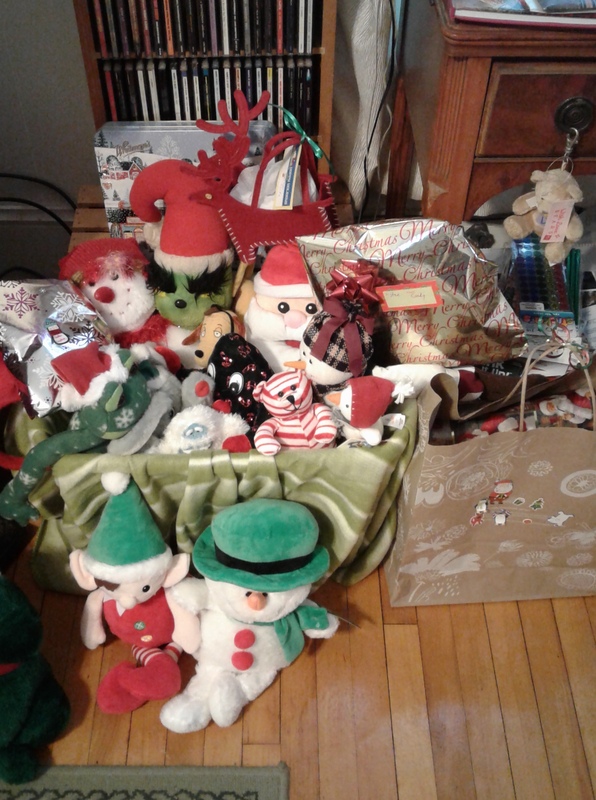 Posted in humor, personal, Wordless Wednesday and tagged blog post, CDs, Christmas, Christmas cards, Christmas decorations, DVDs and videos, words. Bookmark the permalink. 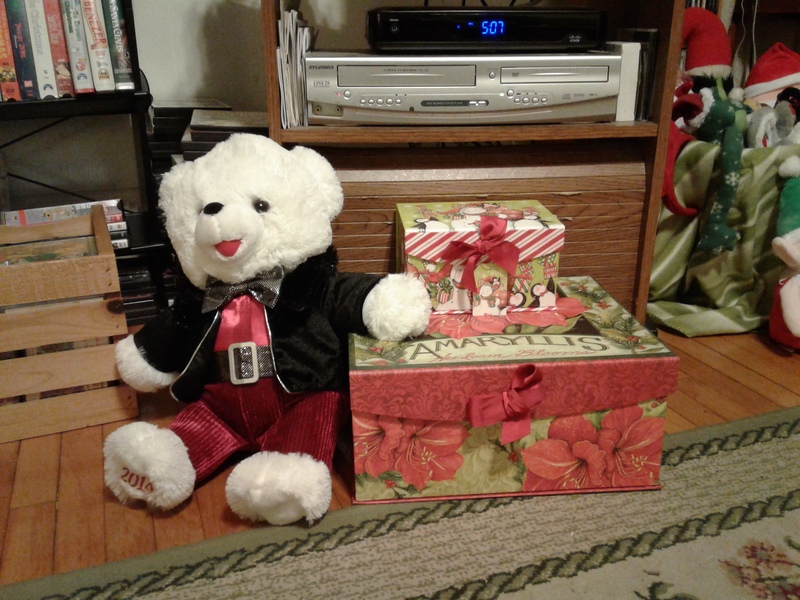 My sister Cheryl gave me the boxes. Steven gave me the bear. When in doubt, lead with a cute bear. My husband, Steven, did some more indoor decorating today, so I took a few pictures to dress up my blog post, in the perhaps forlorn hope of disguising the fact that I have very little to say these days. As I sit here typing, I see a number of things I could also have photographed, so I may use the same dodge tomorrow. Then again, tomorrow is Lame Post Friday, so there will be nothing to apologize for. 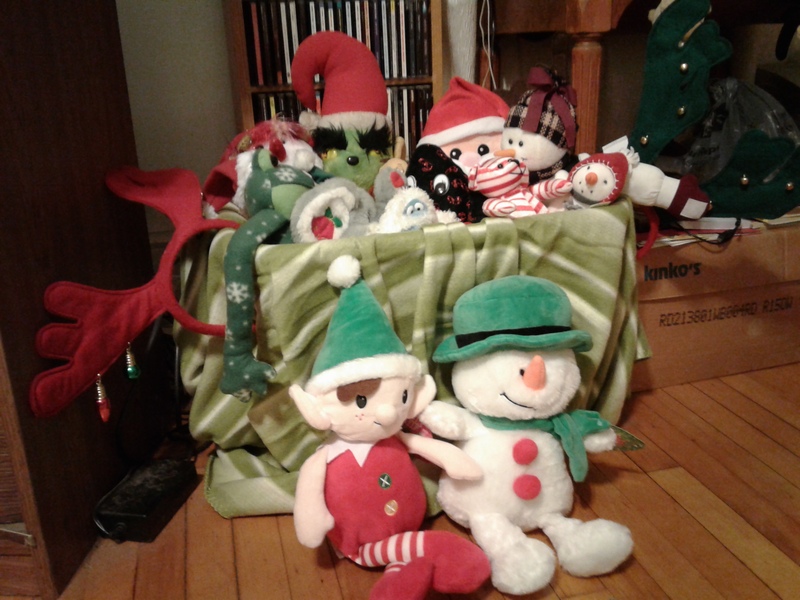 This is, in fact, not all of the holiday stuffed toys we have. The two lounging on the floor in front of the box are recent acquisitions. Steven won them in a claw machine. He often has good luck with those machines. Also note the reindeer antlers. I may wear a pair of those for the Reindeer Run 5K on Saturday. I won’t run fast, but I’ll look cute! 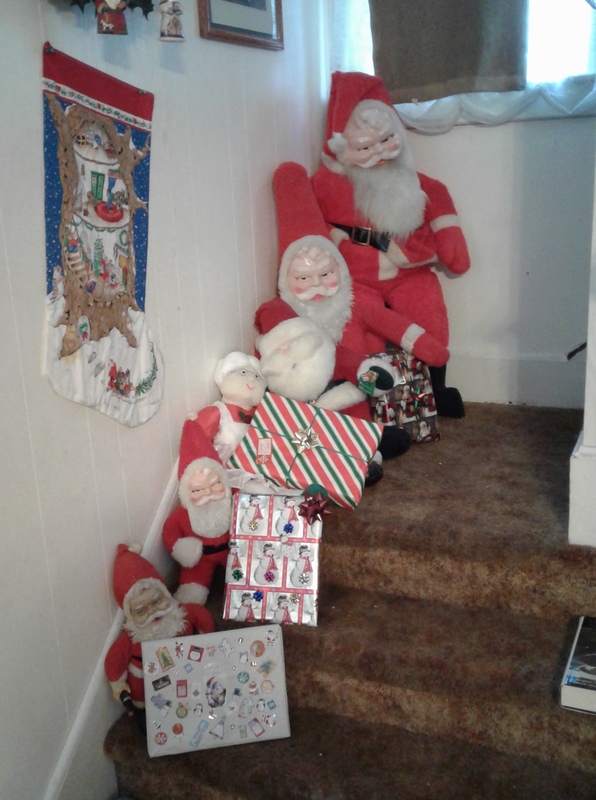 Regular readers may remember the Santas on the stairs from a previous post. This is kind of a busy and wide view. Now that I look at it, I see I should have turned on the stairs’ light and moved my sneakers from the floor. Then again, sometimes these random mistakes are part of my charm. Or do I flatter myself? My sister Cheryl gave me the Santa Claus. We normally put him in the dining room, but I suggested we put him in front of the fireplace this year. Steven added the crowd of stuffed toys today. I think it is a delightful arrangement. She escaped from the Island of Misfit Toys! 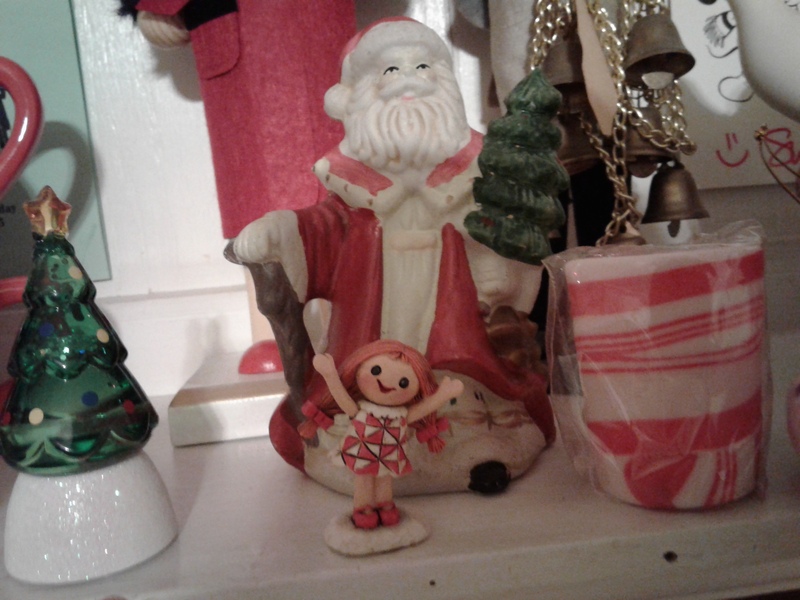 This is a close-up of part of our mantel, because Steven specifically requested a picture of “the doll from Rudolf that doesn’t have anything wrong with her.” I forgot where we got her, or why we only have her and none of the other figures from Rudolf the Red-Nosed Reindeer. No matter. She looks happy now, and it’s Christmas time. And I am approaching 350 words. Woo-hoo! That is quite respectable for a Non-Sequitur Thursday. If only I could think of a catchy headline, my life would be perfect. 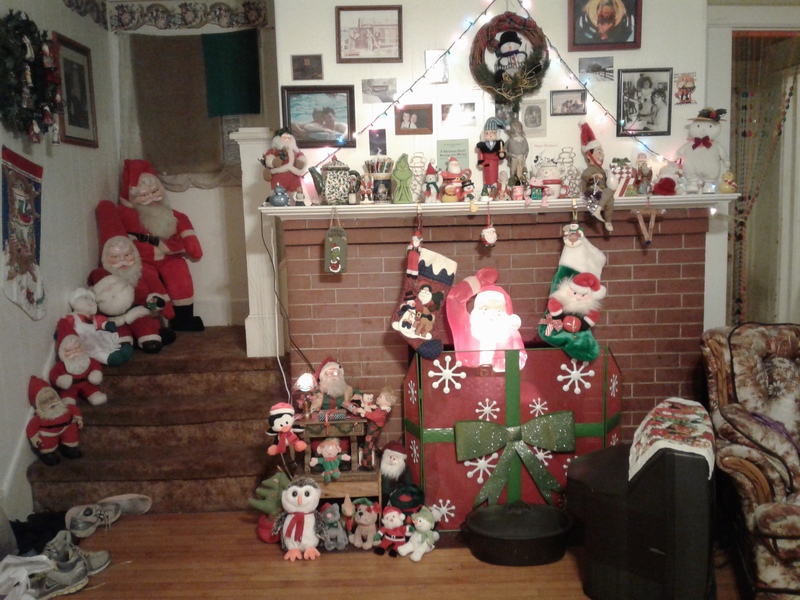 Posted in humor, Non Sequitur Thursday, personal and tagged blog post, Christmas, Christmas decorations, Steven. Bookmark the permalink. If Only I Had a Flair for Blog Posts! I pause in my Sunday activities for a Wrist to Forehead blog post. I am a little down, I confess it. One feels one ought to be in high spirits at all times during the Christmas season, but that is not realistic. So I’ll just ride out the downslope until I feel up again. In the meantime, I do like to make a blog post every day (downslope is not a word? I’ll be damned!). Steven and I did some decorating on the interior of our house today. It would be nice if I took some pictures, but I am currently unaware of the whereabouts of my tablet, and I never did learn how to use that digital camera. Steven did most of the decorating. He has a flare for it. Or do I mean a flair? I don’t know where my dictionary is either. Ooh, I just laid eyes on it when I typed that; it is right in front of me. Wait a minute. I mean flair. I’m glad we got that cleared up. Where was I? Ah yes, having Wrist to Forehead Sunday. I am trying to recruit my energies, because we want to attend the 4th Annual Christmas in Meyers Park this evening. It is easy walking distance from our house. I’m hoping to leave a little early and take the long way down, so we can admire lights on people’s houses around the neighborhood. I have been making mental notes of where they are when I go on my runs. So I owe my readers a blog post about Rome Historical Society, one with pictures of our Christmas decorations, and perhaps one about Christmas in Meyers Park. All these possibilities and here I sit typing my usual nonsense. If that isn’t a reason to swoon onto the chaise with my wrist to my forehead, I don’t know what is! 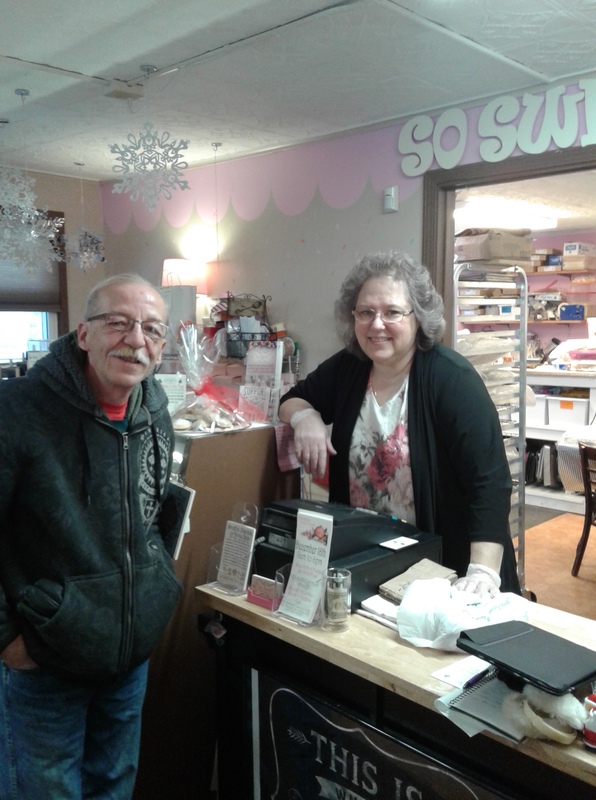 Posted in humor, personal, Wrist to Forehead Sunday and tagged 4th Annual Christmas in Meyers Park, blog post, blogging, Christmas, Christmas decorations, herkimer ny, lame post, not writing, writing. Bookmark the permalink.